What if I told you that there are 8 ways to improve your SEO in less than 30 minutes? Sounds easy, right? Maybe a bit too easy. But it is completely true, and is guaranteed to boost your rankings. First things first, there are a lot of variables that factor into your rankings, over 80 in fact. Some you can control; some you can’t. Some take a lot of time, money, and resources; some do not - like the tips I am teaching you today. Beyond backlinks to your site and domain authority, which fall into that first aforementioned category, the next biggest bang for your buck is on-page optimization. On-page optimization is just that - optimizing the features of your webpages to make the search engines like you more. Let’s get started! To start, do you have separate pages for each keyword you are trying to target? Just for fun, let’s pretend I have a company that offers dog training, dog daycare, and dog boarding. Having separate pages for each keyword doesn’t mean having “dog training” and “doggy training” as two distinct webpages - that’s spammy, and the search engines penalize you for that. But having one “services” URL that lists training, daycare, and boarding all on a single page isn’t effective, in terms of SEO. What you need is separate webpages for each service/product you offer (aka each keyword you are targeting): dog training, dog daycare, dog boarding, etc. One more caveat: it’s important to keep in mind that user experience comes first, and SEO comes second. Using the right keywords in the right place and in the right amount is important, but if done incorrectly, it’s actually harming your readability and turning visitors away, which in turn tells Google that your website is not actually all that good (hint: high bounce rate=bad for SEO). So keep your user top of mind. Page titles are what Google displays in the search results, it’s that bright, bolded blue text. When a user performs a search, this is one of the 2 key pieces that will determine whether or not they click through to your page and it is the primary thing that tells the search engines what your page is about. Hence, it’s arguably the most important on-page SEO factor. Keywords: Include your primary keyword as close to the front as possible, and as many times as possible - but don’t keyword stuff! It’ll hurt, not help. Length: There is no hard and fast rule about how long your page title should be, it varies depending on the words and characters you use. A good rule of thumb is around 65 characters. Google will read everything you include in a page title, it just won’t display everything. Each page title on your site needs to be entirely unique, which shouldn’t be a problem since you have completely distinct pages anyway, right? And keep your business name at the end of your page title, except for your homepage and about page. It’s valuable real estate, use it wisely! As mentioned earlier, there are a lot more off page factors that influence rankings more heavily, and click-through rates are one thing that Google considers when analyzing your site. So try and strike that important balance of writing for search engines and people by optimizing for both SEO and CTR. Pro-tip: Get creative and let your brand personality show through! Don’t get too stuffy and focused on SEO and rankings that you miss other possibilities. 3. How About Your URLS? This is pretty straightforward: you want each URL on your website to be relevant, accurate, short and sweet, with the keywords that the page is about as close to the front as possible, and including hyphens in-between words. Limit the amount of words and hyphens used because Google views the overuse of hyphens negatively. If you already have your pages and URLs established, you’ll want to make sure you use redirects to your new page from your old ones. Remember earlier when I mentioned that the page title was 1 of 2 factors that determine if someone will click through to your site? Well, this is the 2nd factor. The meta description appears beneath the page title and URL in the search results. This piece is less vital for rankings and more about increasing click-through rates (which indirectly improves rankings anyway - double whammy!). Make it compelling! This is the primary piece that will determine whether someone clicks through to your website or not. Use your primary keyword and secondary keyword, but in a conversational tone that, again, will inspire people to click through. Plus, the keywords are bolded in the search results when they match the search query (see example above). Keep it between 150-160 characters. Make sure it is unique for each page, as with all other pieces we have discussed. Dog training with proven, science based methods that never use fear or force! With [company name]’s dog training, you will get the behaviors you want, and eliminate those you don’t. Pro-Tip: This is a great area to test and measure. A/B test different descriptions and monitor how they affect your click-through rate. Click-through rates vary widely. Some #1 rankings see CTR of 35% or more. I’ve been sprinkling this tip throughout the whole post, so it shouldn’t come as a surprise. Back in years yonder, search engines simply used to count the number of times a keyword appeared on a page. The more keywords, the higher your rankings. Win! Nowadays, the search engines are much more sophisticated. So these old school tactics will actually hurt you, not help. The keywords also need to be contextually relevant on the page as a whole. Even if I use the right amount of keywords, if my dog training page is surrounded by information on Florida’s best beaches and unicorn toys, I am going to get penalized. Pro-tip: Your pages should have at least 400 words, and the longer the better. It’s not just about keywords, it’s about the content as a whole. Keyword themes, or keyword pyramids, are the hierarchy of your website, based around a particular theme. 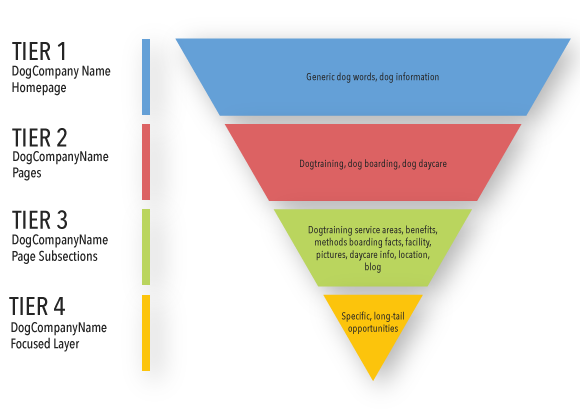 In my example, the theme is “dogs.” The second tier gets more specific, but is still based on my overall theme, i.e. dog training, dog daycare, dog boarding. The third tier consists of more focused subsections of each piece in Tier 2 i.e. pictures of dogs at daycare, information about the facility, training methodology, etc. As you go further down the pyramid, you get more specific and focused, and your content consists of more long-tail phrases. The top of the pyramid helps with your broad keywords, which are are more difficult to rank for but have a higher search volume. As you get more focused further down the funnel, you get less search volume but you rank for specific long term phrases. And done correctly, this is an excellent way to bring in highly valuable and targeted visitors. Take a look at your website. How can you adjust your website to focus it around a similar theme? How can you take advantage of deeper levels that bring in highly-targeted traffic with long tail keyword searches? According to Hitwise, 8-word search queries are up 34,000%. The general trend is that 2 or 3-word phrase searches are decreasing and the percentage of people who are searching for 4, 5 or even 8-word phrases is increasing. So begin building a long-tail phrase strategy, and reap the rewards of highly targeted, more qualified visitors. Bad links really do exist. You remember those yonder years of yesterday that we talked about previously? Well, the methods used in those days created a lot of bad content and links that began hurting websites as Google’s algorithm changed and became more sophisticated. And I don’t mean that they simply don’t help you, I literally mean they hurt your rankings. There is no easy fix for this. First you need to identify where your bad links exist. Then, you need to get them off - and there are only a few ways to do this. Read “Backlinks: The Good, The Bad, and The Ugly” to learn more. OK, so I lied a little bit, that last tip takes more than 30 minutes, but the rest are fairly quick fixes that really can be accomplished with just a bit of time and effort. To be the most successful marketer though, it doesn’t end there. Because then you need to monitor, test, analyze and optimize. Rinse and repeat. And every time there’s an algorithm change, chances are you will have things to change too. Such is the nature of SEO work! No one said it would be easy, they just said it’d be worth it. What tips do you have to optimize your website?